We're excited to have you at the library this week. With so many great programs happening, there's something for everyone. We have just a sampling of programs below; be sure to go to our online events calendar for a full listing of programs. You can also sign up for our email newsletter, where you'll learn more about events and programs, book suggestions, and more. The DMPL Podcast is back from a holiday break tomorrow. Iowa native and writer Paul Kix is the author of The Saboteur. 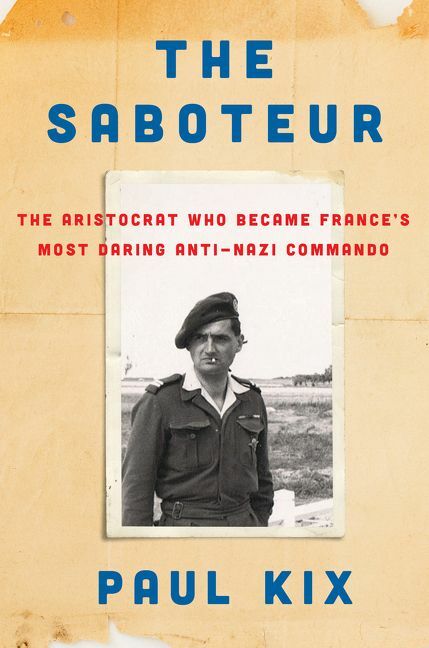 The book tells the real-life story of Robert de La Rochefoucauld, a French aristocrat-turned-French Resistance fighter in WWII. La Rochefoucauld's story jumps off the page - he escaped from Nazi confinement multiple times - and Kix talks about not just discovering his life, but the time and effort it took to research the story. Later on this week, we'll be looking at the most anticipated books of the year - nonfiction on Wednesday, and fiction on Friday. In case you missed it, we talked all about New Year's Resolutions last week. We shared our staff's reading resolutions, and we gave you a list of books that will help you stay motivated to keep your New Year's Resolutions. Find funders for your nonprofit. Learn to use the Des Moines Public Library’s comprehensive funding research tool, Foundation Directory Online. You’ll learn to search for grants and related resources from nearly one million grant opportunities. Register by calling 283-4152 ext. 3 or clicking here. Come to a petting zoo that makes lots of noise but sheds no fur. Children ages 3 and up are invited to play a violin and cello and learn more about classical instruments with help from the Des Moines Symphony. Registration is required – register by calling 283-4152 ext. 3 or clicking here. Vengan a celebrar el Día de Niños Inventores con un poco de diversión bilingüe en la biblioteca de East Side! Construyen una montana rusa, una torre de Legos, una fuerte de almohadas, o un Puente! Paint a winter scene while sipping cocoa from a D.I.Y hot chocolate bar. Kids will get their own mini canvas and follow a guided step-by-step painting process or they can go freestyle and learn some wild techniques. As supplies last. ROAR! Come to the land before time and learn about the creatures that once roamed the world. We’ll have activities, games, and crafts that are all about dinosaurs, big and small. For ages 3-8 years old. Forest Kids Flicks: Monsters, Inc.
Boo! When a toddler arrives in Monstropolis, it’s up to monsters Mike and Sully (voiced by Billy Crystal and John Goodman) to get her back to the human world before other monsters notice. Will they succeed? Come to Forest Avenue Library and find out!